So this isn’t even a real blog entry, it’s just me putting up my half-formed notes about how to do a Pokemon-to-LL conversion for Scrap, further to this discussion on G+. Roll d100. This table doesn’t care what Pokemon you’ve encountered; you could just use one of Wikipedia’s monster lists or Yokai or whatever. All it gives is HD and basic attack damage. Any critter rolled off this table gets its HD as a bonus to-hit. All Pokemon have an attack move of their own type. Damage depends on HD as above. 1 = Normal 2 = Fight 3 = Fire 4 = Grass 5 = Water 6 = Ice 7 = Ground 8 = Rock 9 = Flying 10 = Steel 11 = Poison 12 = Electric 13 = Psychic 14 = Ghost 15 = Dark 16 = Bug 17 = Dragon 18 = Fairy 19-20 = dual type: roll twice. If a Pokemon has 2 types it alternates attacks between them. The type of an attack gives a damage multiplier vs. the type of the defender (and maybe you could have types of armour, too? Why not). This is one insane lookup table, cribbed from Bulbapedia. Imma say humans are NORMAL, elves are GRASS or FAIRY, dwarves are ROCK, halflings are GROUND, and monsters are whatever you like. Undead should prolly be DARK. There is a chance of a critter also knowing moves of other types if you roll under their HD on a D10. If so, roll on the type table above. And they may have a status-affecting move (roll under their HD on D10 to see). If so, roll d10. All status moves allow saves except where noted. 9. Sleep next round. No save – you will fall asleep next round. After that you can save to wake up. That’s it for the abstract version. Oh, you were hoping for some of Pokemon’s Extra-Crunchy Crazy, like a full conversion? Fine. 2. MORE COMPLEX CONVERSION FOR POKEMON PCs or a game in which Pokemon can level up. And here it is as a Google Drive doc. The first set of columns is how many HD they should have if you encounter them in the wild, also the HD die size for calculating their HP (some really big ones get eg 2d8 hp per level). Dam. mod on the excel sheet above is effectively the critter’s STR bonus/penalty – it gets applied on top of the damage from the move and modifies the Pokemon’s to-hit rolls (like str bonus). Also, you add level to your to-hit rolls for fighters, right? Same for Pokes. WTF is Magic mod? It’s what I’ve got for Special Attack. There is no ready equivalent in DnD for the separation of attack and defense into “Physical” and “Special.” But. Physical attacks imply contact, special attacks do not. So, as a quick ‘n’ dirty workaround Imma say that all Special attacks are in fact magic effects, and you get to Save vs. Magic against them (or maybe the Poke has to hit you with them as if they were ordinary attacks but they have this Other Mod to deal with on that to-hit roll). This mod is either applied to your saving throw target (ie if it’s low, that means the Poke is crap at it) or to the Poke’s to-hit roll. Save is the number the Poke has to roll over to save v. whatever, at level 1. It improves by 1 every 2 levels. Initiative modifier should be clear? “Double for move” is what it says: double this number and you get the DnD “move” stat in feet (so Bulbasaur can keep up with a lightly-armoured PC at 90′, while Munchlax is almost sessile at 10′ and Ninjask is insanely fast at 320′). And then after the types/descriptions there are the original Pokemon stats so you can correct my work. Don’t worry about the “nonsense” column. 5 Pokemon levels = 1 DnD level. Start at level 0, so a level 4 Pokemon is still a level 0 DnD character; Pokemon level 30-34 is DnD level 6 (this being useful for calculating when Pokes should “evolve” or learn moves if you wanna check all that on Bulbapedia). What xp chart does my Gyarados use? Oh god. Yeah. Um, Pokemon takes full advantage of being a computer game to mess with the xp model. In the end, most Pokes are divided into 4 categories for xp-for-next-level. Imma say that “fast” = cleric xp table, “medium fast” = fighter, “medium slow” = MU and “slow” = elf. After that, you’re on your own. Could this be incorporated in the master table, above? Mmmmaybe, but not by me. If only I had the time and patience to sort all Pokes by type, frequency, power and preferred terrain, and then generate full encounter tables! Sorry. In lieu of that, the most gonzo approach is just to roll d8-1 for the hundreds, then percentile, and that’s the Dex# (Pokedex number) of the encounter. They’re all tabulated here. Null result means the Pokemon got away before you could ID it. Use the LL chart based simply off HD. Add 30% for each extra attack it has beyond the first. This is not a pure conversion. Honestly I despair of doing any such thing b/c Pokemon delights in outliers at the extremes of the curves that screw things up and I used a bit of fudge factor to make sure we don’t have a bunch of categories that only have like 2 Pokes in them. The singular Save is based off Special Defense and is assumed to be Save vs Wands or similar (that being missile-type magic). 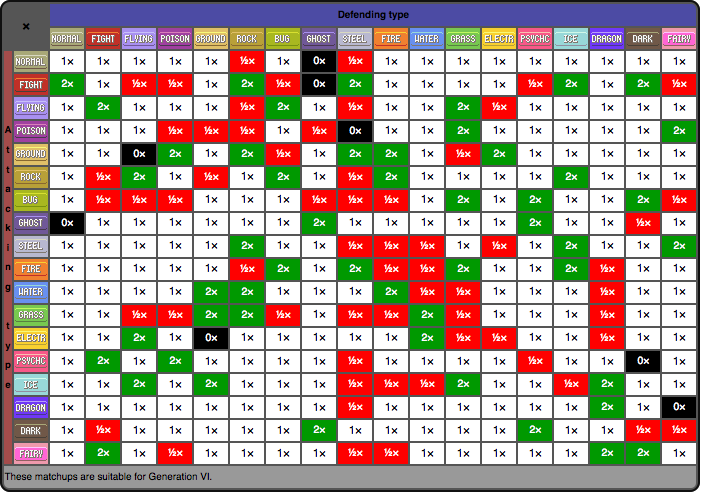 Other saving throws are tricky: poison and steel types should be immune to poison, flying should be especially vulnerable to electric attacks, water should be harder to drown… use the Type chart and improvise. Hey, so Pokemon Sun/Moon came out; I don’t want to bother you to update this post, but can I ask how you did your calculations? How did you determine HD, Damage mod, Magic mod, Init. Mod, Saves, AC…? This is one of my favorite blogposts in the entire OSR scene and I reference it a lot for my games, so I hope you answer soon! I’m so sorry for taking months to get back to you! WordPress didn’t tell me about your comment until this morning. he’s worth following in general. If you’re on google+ (which I am for now at least) look me up – Richard G. (yeah I know not very searchable but the icon’s the same). I will be resurrecting my pokemon thoughts in the next 2 months to run Counter-colonial Heistcrawl (finally). So is the listed HD what the Pokemon starts with at level 0 or what they have at level 1? I figure level 0 Pokemon have 1hp. But if you take that away they don’t die, they just disappear for the encounter, so you can still encounter them again.